Come for the experience. Stay for the friendships. The UBC Athletics and Recreation Department is dedicated to creating a healthy, active, and connected community where each person is at their personal best and proud of their UBC Experience. Some applications are posted throughout the year, others are posted in certain months. Always check UBC Careers Online for all our latest Athletics and Recreation Department job postings. *Officials applications are open at the beginning of September and hire consistently throughout the year until February for both Term 1 and Term 2. 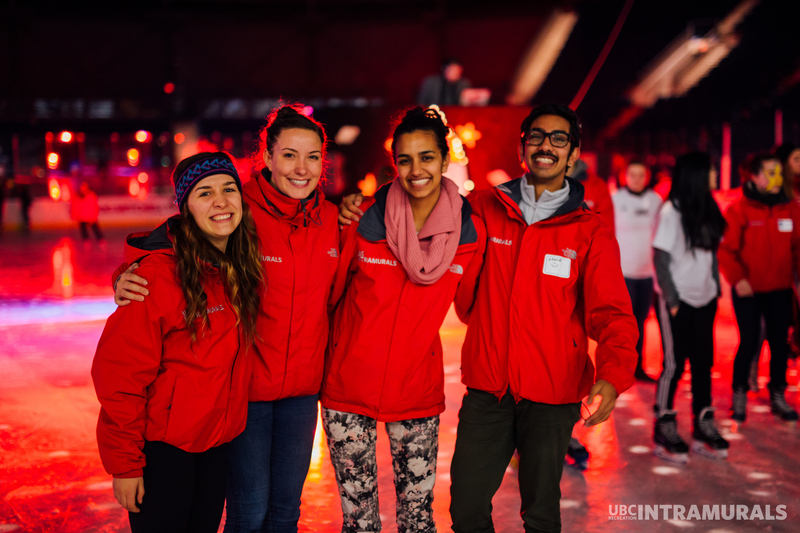 Officials are separate from UBC Rec volunteer positions. Refer to the Intramural Program below for details. Look through our Job Summaries and find what best suits you. Click on the title of a position to open up the job summary. Links to a full PDF of the job description found on Careers Online are included in the job summary by clicking on the photo or within the text. The following facility operations positions are for students only. As part of the Work Learn Program, these jobs allow for UBC students to continue to pursue their degree while earning an income, develop professional skills, and learn in a work environment. These positions are a chance for students to contribute to their personal goals as well as the University in a way outside of their academic life. At War Memorial Gym you're often serenaded by the sound of a volleyball or basketball in the background. Be ready to help set up sport equipment, and enjoy the scent of freshly laundered towels and uniforms. If you're ready to work closely with Varsity and Recreation, War Memorial Gym operations is the place for you! So you plan your life schedule around the Grand Slams? With a great view of the courts and lots of different age groups of people to meet, your initiative and positive attitude would fit right in at the UBC Tennis Centre! If you can skate well, you're one step closer to joining the Arena Operations Staff! You'll be able to apply your organization and problem solving skills, learn to sharpen skates, and, not to mention, show off your extremely experienced skating abilities as an on-ice supervisor during drop-in! Know what's better than the colours of a Gator vehicle? Driving one! With the smell of morning dew on grass and the wind blowing through your hair, what's not to love about a job that gets you outside and interacting with field sports? Put your independence, and telephone voice skills to the test as part of the Thunderbird Stadium and Park team! Start your day off right with the calming scent of chlorine wafting through the UBC Aquatic Centre. A great place to show off your attention to detail, communication skills, and love of all pool-related activities, the UBC Aquatic Centre is the place to be for a student like you. Come join us and embark on our journey of opening the new UBC Aquatic Centre! You are a team player who loves talking to people and making their day! In the fast-paced environment of the Student Recreation Centre, you can thrive talking to patrons, and answering UBC REC league questions. Plus, who doesn't like selling Gatorade, renting equipment, and putting wristbands on friendly students like yourself? #Gains is your middle name, and at this point you basically live at the 'Coop. With your friendly personality and interest in safe training protocols, you might as well work at the BirdCoop Fitness Centre too either as a Weight Room or Front Desk Attendant. Bring your passion for fitness to the team! Your love of baseball and/ or softball watching on the big screen is waiting for you at the UBC Baseball Indoor Training Centre. With a love for retail, and new high-tech equipment, your friendly personality and ability to self-motivate could make you a hit on our team. Come join our facility and enjoy watching the baseball season, automatic pitching machines, and more! Ready for a scenic location and cool events? Be prepared to dress up and help with events, ranging from weddings to corporate functions. If you're into audio-visual equipment, problem solving and working with guests, even better! Make the John M.S. Lecky UBC Boathouse your second home! What's that? Just the sound of your voice flowing majestically over the water as you instruct various athletes how to row. If you love being outdoors, have patience, rowing experience, and love coaching, being a UBC Boathouse Rowing Instructor could be the role for you. Come join our team at the scenic John M.S. Lecky UBC Boathouse. These positions are open to everyone that has the required level of experience. Join our group of experienced tennis coaches and teach with some of the best in the Lower Mainland. Your professionalism, poise, and power will shine from teaching others that want to become the next generation of superstars or have no plans to retire early. These positions are open to everyone that has the required level of experience. As an Instructor, you are patient, hard-working, self-motivated, and can easily interact with all age groups. You have a sound knowledge of hockey and skating from your own background and coaching experience, and can easily teach those skills to others. These positions are open to everyone that has the required level of experience. As an Instructor, you are patient, hard-working, self-motivated, and can easily interact with all age groups. You have a sound knowledge of baseball/ softball from your own background and coaching experience, and can easily teach those skills to others. These positions are open to everyone that has the required level of experience. This Lifeguard-Instructor position at the UBC Aquatics Centre is a positive role model, performing a variety of duties including supervision of the pool, instructing group classes, promoting aquatic safety, and enabling a positive experience for all participants. These positions are open to everyone that has the required level of experience. With a over 50 different instructional classes throughout the year, we need the person-power to make it happen! If you have a background in dance, fitness, martial arts, yoga, pilates or outdoor sports, and have a passion to teach others your skills, this is the job for you. These positions are open to everyone that has the required level of experience. Do your ears perk up every time you hear the latest hockey game stats? Perfect! We need thorough, accountable people like yourself to help us as an Arena League Attendant. Put your hobby of making calls from the sideline into practice as you enjoy watching hockey games and keeping track of the stats! These positions are open to everyone that has the required level of experience. As a UBC Camps Leader, you are patient, hard-working, self-motivated, and can easily interact with all age groups. You have a sound knowledge of a specific sport from your own background and coaching experience and can easily teach those skills to others. From hockey and baseball to aquatics and tennis, there's something for everyone! Have a commanding presence? What about your own whistle? If you're 2 for 2, becoming a sport official for our UBC REC Intramural Leagues is where you want to be! From nine different leagues to choose from, there's bound to be one where you know the rules like the back of your hand! The UBC Thunderbirds Sport Clubs stream allows competitive club sports to compete in non-CIS/ NAIA sports while officially representing the University. If you're up to the challenge of throwing down with one of the newest programs in UBC Recreation; this is the place for you! The work, although primarily administrative, leads to often having your "hands in a bit of everything." Always wanted to work in an office? As an Admin Assistant to our UBC Recreation Programs Staff, you'll learn the internal workings of all UBC Recreation Programs. With your attention to detail, passion, and independent work ethic, nothing stands in your way other than an application. With an eye for design, creative flair, and sound knowledge of Adobe Creative Suite, the Marketing and Graphic design program staff is your calling! Work with the UBC Recreation Marketing and Communications team on several different campaign designs and social media platforms to promote Athletics and Recreation for all! Do you already attend our UBC Rec Intramural Events as a spectator? Why not get the inside scoop and work with us instead! As an Intramural Programs Assistant it's your job to assist in the implementation and development of some of our fantastic programs! These may include UBC Triathlon Duathlon, UBC Staff and Faculty Sports Day, and others depending on when you apply during the school year. 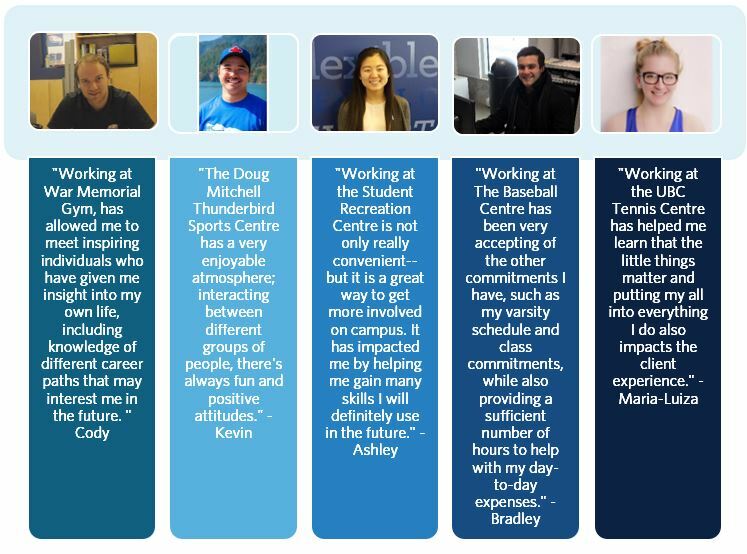 Find out how current and past student staff members feel about working with UBC Athletics and Recreation. Learn how to join our family. Visit the Centre for Student Involvement and Careers for support on how to apply. From advising, to workshops and resources, the CSI&C is there for you to help build your career. Open Monday- Friday 9:00am-5:00pm, booking an appointment to speak with an adviser on how best to apply to one of our job postings is easy. For more information visit their website and explore the possibilities to help further your career. Spruce up your Resume and Cover Letter. Just like how you are a unique individual in the sea of UBC students, hiring managers are different too, and take notice when you cut and paste your resume from another job to theirs. Tailor your application to compliment the job you apply for, using key words, characteristics, and skills you think they would look for. Don’t have much work experience? Why not volunteer first! Through the Intramural program, there are multiple opportunities to get involved as a student volunteer. Volunteers fill roles in game management, event planning, sport officiating, human resources, public relations, facility supervision, marketing, program delivery, and more. Described by our student leaders as a “life-altering experience that offers unique leadership development” and assists them in future endeavours. Whether it’s a career in sports management, event planning, promotions, marketing, or any other field - our students leave this program with leadership skills, extensive practical experience, and memories that will last forever. No matter what your major is here at UBC, there is a role that can benefit you and your resume! Volunteering not for you? We have Co-operative Education and Internship positions as well! The UBC Athletics and Recreation department partners with various co-op programs in the university and internships across the Greater Vancouver area to create great learning experiences as a paid work opportunity. Our positions cover different fields such as high performance and personal training, sport marketing, sport management, event planning, and business administration. Find what's best for you by contacting your Co-op program's coordinator or Workplace supervisor. Who can I contact for general inquiries not answered on this page? For general inquiries, please contact the following person who can either redirect your call to one of our managers, or answer your question(s). We ask all applicants to submit a resume, cover letter, and class schedule for the upcoming term. If you don't know your class schedule, make sure to note that in your cover letter. Can I apply for more than one job posting? Yes. Please apply to each one separately. If job postings are open, applications can be sent on UBC Careers Online, otherwise, visit in-person at the particular facility you wish to apply for. I'm here as an International Student. Can I apply? Yes. If you are hired, you will need a Canadian Social Insurance Number (SIN). What is Work Learn/ Work Study? The Work Learn Program offers job opportunities for UBC students, both domestic and international, to develop their professional skills in a practical setting. For more information about eligibility, please visit their website.